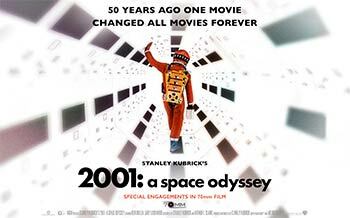 2001: A Space Odyssey - 50th Anniversary! Keir Dullea, Gary Lockwood and William Sylvester. From its startling depiction of our origins to its extraordinary imagining of our final evolutionary stage, this mind-altering journey is perhaps Stanley Kubrick’s finest achievement. We are proud to present this new “unrestored” 70mm print, struck from new printing elements made from the original camera negative, that recreates the cinematic event audiences experienced 50 years ago.